With Super Bowl 53 Comes Public Art, But Is It Enough? Yungai's paintbrushes sit in front of the wall where he paints his mural. 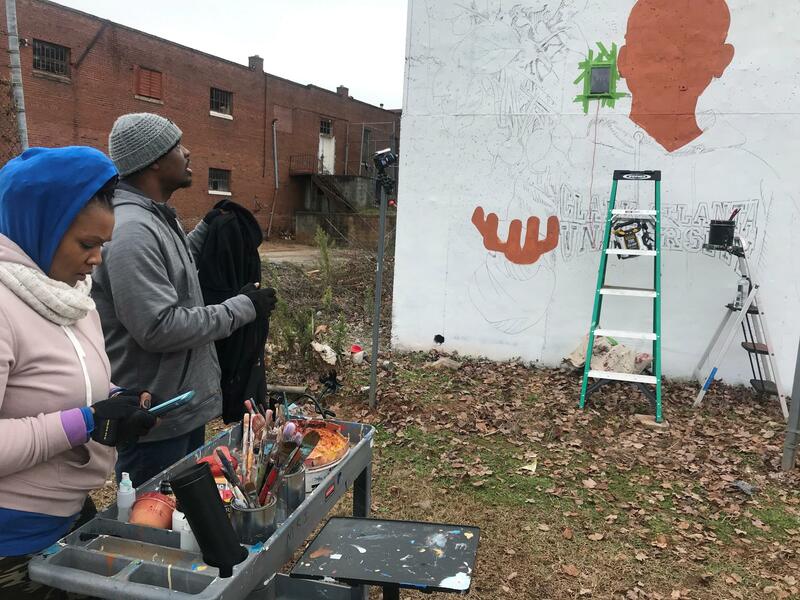 On an overcast day in mid-December, Muhammad Yungai stepped back and examined his progress on a large, white wall located a few blocks south of Mercedes-Benz Stadium. In less than two months’ time, the stadium will host the biggest game in professional football, but Yungai is part of an initiative meant to live on long past the Super Bowl. The mural project dubbed “Off the Wall,” is an effort to increase public art ahead of Super Bowl 53’s arrival to Atlanta. In total, the initiative will result in 30 new murals around the city before the game on Feb. 3. Other parts of the effort will see investments in minority-owned businesses and a focus on child nutrition. Yungai is one of 11 artists creating murals across Atlanta as part of the city’s Legacy 53 project. The one he’s painting on the west side was inspired by a conversation he had with students at Spelman College — where they mentioned the impact of urban agriculture. The mural will display a vegetable floating just above the extended hands of four actual students, each standing about 15-feet tall, with smiling faces. They’ll represent some of Atlanta’s historically black colleges and universities: Spelman, Morehouse, Morris Brown and Clark Atlanta. Yungai will paint three murals as his contribution to the project. The inspiration for each one came from community conversations, like the one he had at Spelman. During the gathering at Spelman, Yungai listened intently as a group of students spoke about what they do and do not like about Atlanta and various initiatives around the city. As they talked, the Atlanta artist nodded and took notes. Joi Stewart, a junior at Spelman who hails from New York, was one of about 20 students who sat around a large, wooden table. As Stewart chatted with Yungai and her fellow students, she sounded pleased about the effort but said she wished this could happen independent of a large event coming into town. “My biggest concern is that this will be yet another action that ends where the Super Bowl ends,” Stewart said. However, Atlanta Mayor Keisha Lance Bottoms has said the murals are about creating something can live on long after the game is over. 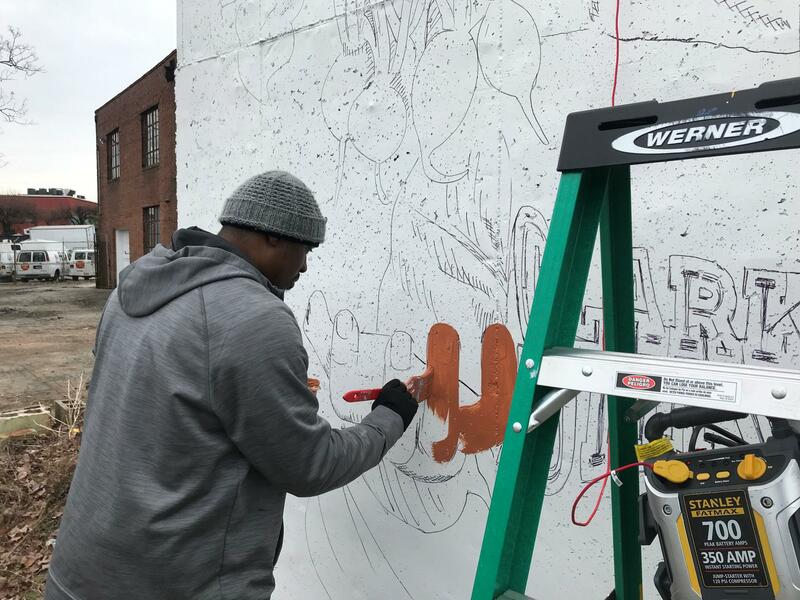 “As we prepare our city for great events like the Super Bowl, it’s important that these events have a lasting legacy within our communities and that’s what these murals are all about,” Bottoms said. With the enormity of an event like the Super Bowl, cities usually try to get a lasting benefit from the game that goes beyond booked hotel rooms and monetary benefit. During last year’s game in Minneapolis, about $4.5 million was donated to local organizations to help fight hunger, build playgrounds, and even construct build a sculpture. It’s not out of the norm for these Super Bowl legacy initiative to include art, but it’s not usually done on this scale. Brett Daniels, with Atlanta’s Super Bowl Host committee, said it’s the city’s civil rights history makes it a special canvas. Yungai and his wife prepare paint as he continues to paint his mural. For Yungai, he said he has two goals when it comes to his murals. He said he also understands Stewart’s concerns and feels a sense of responsibility to the Atlanta community and those he’s talked to, especially African-Americans. Yungai says it’ll take him about a month before he completes the mural. As he looked up at the wall, before climbing his ladder to continue painting the HBCU students, Yungai paused and said he knows he won’t be able to control how long the mural stays but he wants it to be meaningful as long as it’s there.